It's sort of prog, sort of metal, sort of heavy...it's a whole lot all at once. 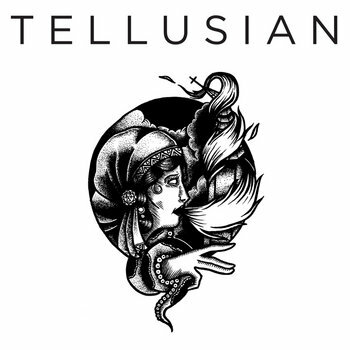 Tellusian are from Sweden and have no qualms with showing their musical aptitude. For all the technicality the band never loses a nice flowing groove. Aside from the discordant and noodly guitar/bass work, the vocal and drum work were really the first thing to hit me. There's some very impressive drumming happening here that incorporates double bass movements in a tasteful and creative way. Vocally I'm hearing something that reminds me of Titan or Buried Inside, mostly for it's lower register growl and relentlessly brutal approach. At times you'll hear a clangy bass peak out for a short solo before the crushing guitars fill back in. For such accomplished musicians, they haven't forgotten how to work as a team and meld together nicely.